HBO's Westworld has a sprawling sense of setting, inspired by such immersive video games as Grand Theft Auto and Red Dead Redemption, and evinced with seemingly endless character narratives and hidden "game"-like side quests (you know, like the one currently directing The Man in Black's course). Way of life here hasn’t changed much since the day it was settled. Feel free to make yourself at home and chat in the town square, charm the barkeep into divulging family secrets, or just relax and take a break from the heat. Practically everyone in this town is related and they are very protective of one another, so tread lightly. Don’t let the dusty patina fool you, this town proudly carries the scars of showdowns past. The swaths of land that haven't aired -- Ghost Nation and New Virginia -- appear only as unclickable names. Some sound like great candidates for the location of that maze the Man in Black wants to find. Is it in the mines? The Old Territories? Cryptic as hell. The latest Westworld Weekly, sent out Monday, included a recruiting message. "Looking for a new career?" it read. "Check out our state-of-the-art facilities, where staffers live during their Westworld work rotations." 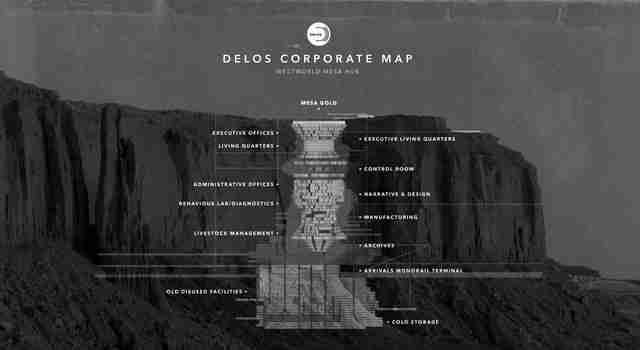 Clicking the message led to a short video on the Delos Inc. site that detailed the park management's headquarters. Based on exterior shots from the show, we know a base of sorts is housed within a mesa, a chunk of raised flatland with clifflike sides. Most of the labeled sections above are self-explanatory (executive offices, control room, narrative & design -- we get it). And cold storage, which Theresa Cullen referred to as Sub-level 83 in the premiere, is where Dr. Ford drank whiskey with creaky "second host" Old Bill, and where Peter Abernathy and other decommissioned models spend their creepy retirement. Less clear: Is the arrivals monorail terminal the same set of tracks guests use to access Sweetwater? And what are these "Old Disused Facilities"? "We have designed the world's finest decompression chamber: the Mesa Gold. At the conclusion of your stay, begin the process of dipping your toe back into the real world: swap adventure stories with other guests, drink award-winning cocktails, experience food prepared by world-renowned chefs, burn off adrenaline at professional-grade athletic complexes." 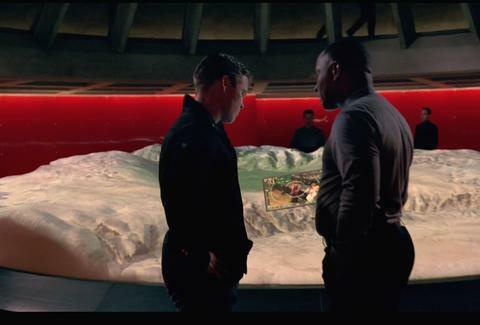 Viewers have wondered whether the Westworld grounds and the mesa hub exist within the same physical world. This second map (considering the Mesa Gold, specifically) might indicate they do. If so, where the heck is this mesa hub on Discover Westworld's map? It seems like it would most likely be nestled somewhere in the canyons, between the Old Territories and the ranch land. But it's still not entirely clear how patrons, robots, and workers get to and from the park. 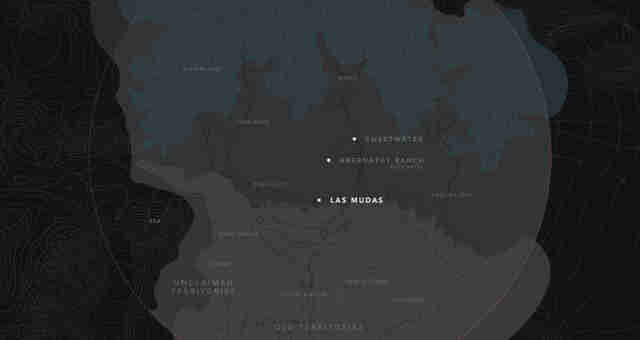 Unfortunately, the maps yield more questions than answers right now. But both, along with their corresponding websites, look poised to become more meaningful -- with more updates -- as Season 1 continues. Bookmark them for clues and stay tuned. Sean Fitz-Gerald is a staff writer at Thrillist Entertainment, and is ready for "Inferno" theories. Find him on Twitter: @srkfitzgerald.